These steps will guide you through the process of importing your membership database and results into SwimOffice. If they are stored in Team Manager™, continue to the next section. If they are stored in some other format, please read how to import your membership database using our Excel spreadsheet below. Team Manager™ (TM) is made by Hy-Tek, a separate company, so our systems are not connected to each other. Therefore you need to transfer your data from TM to SwimOffice. Note: If your team has Meet Manager™, it likely has Team Manager as well. First, prepare your settings and membership database for exporting. This is important to make your data as complete as possible to ensure a smooth transition to SwimOffice. If your team belongs to a governing organization such as Swim England or Canadian Swimming that assigns unique IDs to athletes (except for USA Swimming), please skip down to Clean up membership database. But if your governing organization does NOT assign IDs to your athletes, or it is USA Swimming (USA-S), you need to make sure every athlete in your membership database has a unique ID. This is what SwimOffice uses exclusively to connect athletes to their results, rather than athlete names like TM does. Given that all TU teams have their membership and results stored in a common database in the cloud, you can imagine how common a name like Chris Smith is! In Team Manager, click Teams in the main menu. Set your Team Registration dropdown to USS if it is not already. What this does enable the Build ID button on the Athlete Information screen to create IDs based on the USA Swimming format, where IDs are assembled from a swimmer's date of birth, first three letters of their first name, middle initial, and first four letters of their last name. It's a simple but effective algorithm for creating unique IDs. Next you will go through your membership data to ensure your data is as complete and accurate as possible. Fields highlighted in yellow below are required. Click Athletes in the main menu. Double click the first athlete in the list. This opens the Athlete Information window. An athlete's First and Last Name are required. A Middle name or initial is now required by USA Swimming and highly recommended for all non USA-S teams, as having one increases the probability of each athlete having a unique ID. Use an asterisk ( * ) if the athlete actually does not have a middle name. Birthdate and Gender are required. ID # is required, even for inactive athletes. Without it, it is impossible to connect the athlete with their meet results. 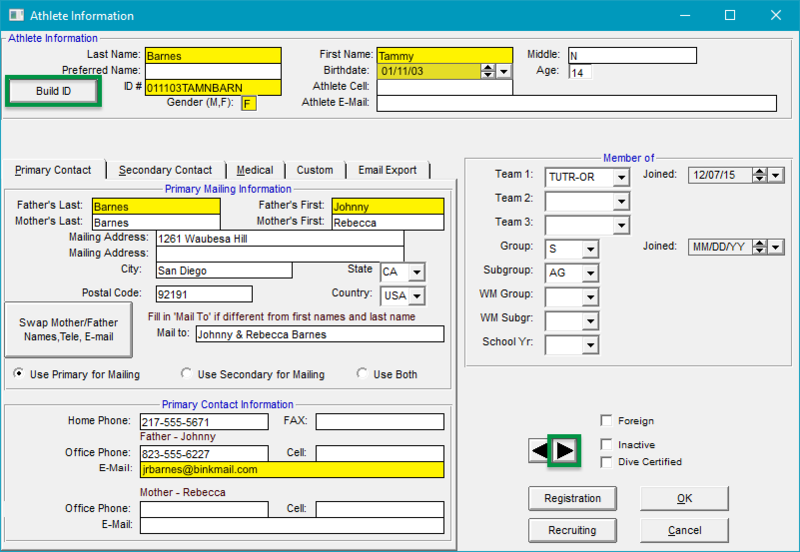 Fill in the number assigned by your swimming governing body, or click Build ID if your governing body does not assign IDs and the ID # field is blank. 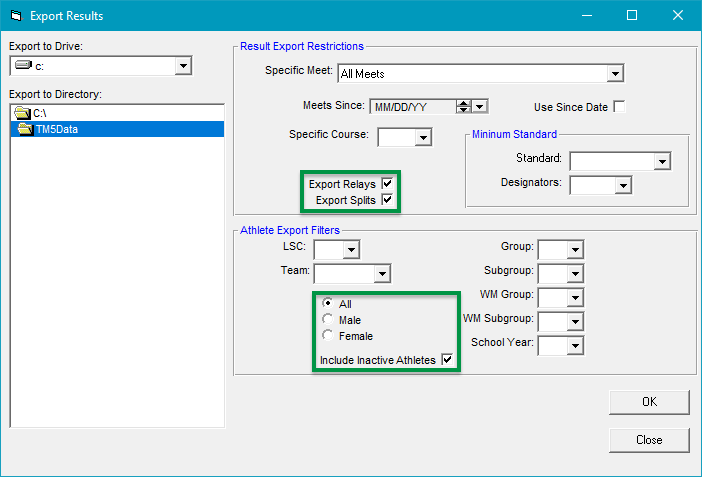 Exception: If we won't be importing results for you, you will need to build IDs for all athletes once they are in SwimOffice for connecting with future results. One parent's First and Last name are required for active athletes. This is to prevent twenty kids from all being assigned to the same Smith family. It is good to have their address, although they can login later to your SwimOffice site and add it themselves. It is good to have at least one phone number, although they can add it themselves in SwimOffice. At least one parent email is required for active athletes, because that's what the parents use to login to SwimOffice, and our importer will not import the membership database without it. If they don't have one, have them sign up for a free email account on something like Gmail or Hotmail. Again, every single Account for active athletes must have an email. Click the arrow in the lower right to move to the next athlete. Click OK when finished with all athletes. Scroll through your athletes and make sure every single cell in the ID column is filled in, then click the lower close X in the upper right. 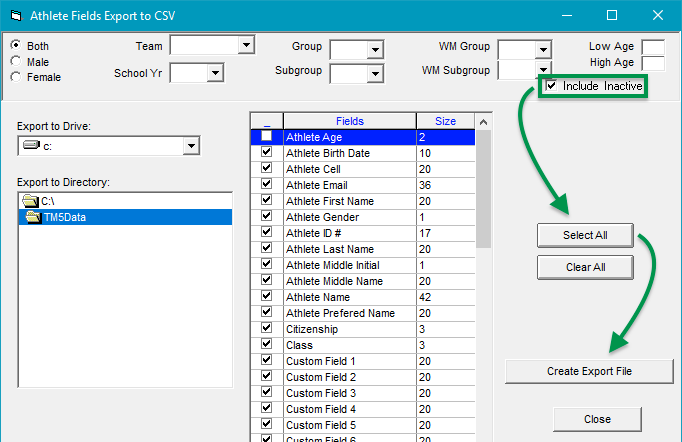 Click File > Export > Athlete Fields in CSV format. This opens the Athlete Fields Export to CSV window. Click Select All and Yes to confirm. Don't worry that Athlete Age isn't checked because we don't use that field. 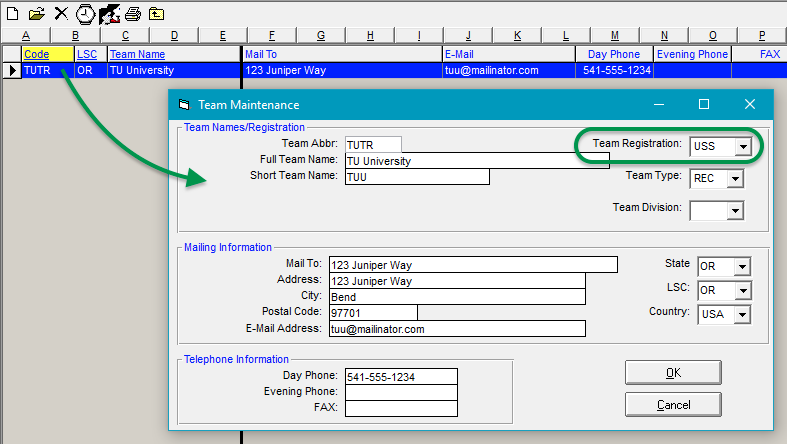 If your version of TM does not have a Select All button, manually check every single checkbox in the Fields list. Click Create Export File and Yes to confirm. Note the filename and where it was saved, then click OK. These instructions are for Team Manager. UK users see below to export from SPORTSYSTEMS. Click File > Export > Meet Results. This will open the Export Results window. Check the Export Splits box. Check the Include Inactive Athletes box. If there is an Include Swimmers with No Results box, make sure it is unchecked. Click OK. A progress meter will activate. In the menu click Meet > Export > SDIF to to open the Standard Data Interchange Format Export dialog box. Choose All or Club from the Export By box and select the clubs, fill in the City/Town details and click Export. A pop up box will confirm the export is complete. The exported file is saved as an SDIF file (sd3 file extension) in a sub-folder called SDIFRank in the main meet folder. Sign In to your SwimOffice site if you haven't already. In the side menu click System > Deployment Dashboard. Scroll down and click the DATABASE MIGRATION header to open that section if it is not already. Locate the membership file where TM saved it and double click it (or click it once and click Open). Locate the results file where TM saved it and double click it (or click it once and click Open). The TU Deployment staff will automatically be notified when you do this. They will verify that the data in the files is usable, import the data into SwimOffice, and mark the tasks as complete in the Deployment Dashboard. Note: TM will export the membership data with the father's email as the primary address, and everyone in the Account will use that for signing in to SwimOffice. If your team would rather have the mother's email be the primary, email deploy@teamunify.com to let us know that and we will make the switch on the backend. If your membership database is stored in some format other than Hy-Tek's Team Manager™, you may transfer your data to our membership database spreadsheet. Open the spreadsheet and transfer your membership database into it. Please DO NOT CHANGE THE HEADERS (column names), and do not add extra columns. Please contact Deployment if you have questions about any columns or data you want to include. Data for all columns with a red header is REQUIRED. We cannot accept the spreadsheet if ANY of those fields are blank, except for Member Middle Initial if you are NOT an official USA Swimming team (although it's highly recommended), and ID Card since we won't be importing results for you (because they can only be imported from Team Manager). However, you will need to build IDs for all athletesonce they are in SwimOffice for connecting with future results. Click select column headers to see a note with more details about the field (at least when using Excel). Columns A-Q all relate to the Member or child. Columns from R on relate to the Account or parent(s). Save the spreadsheet once you've entered all membership data. Locate the spreadsheet file where you saved it and double click it (or click it once and click Open).